1. Super Smash Bros. used licensed Nintendo characters without initial permission. 3. In the original ‘Legend of Zelda’, the Tri-force was meant to be three computer chips used by hero to switch between time periods, making him the ‘link’ between worlds. 4. EA had to recall all copies of Tiger Woods PGA Tour ’99, because it had the full South Park-pilot hidden on it. 5. Japanese Kirby game covers have a smiling Kirby, while American covers have a mean-looking Kirby. 6. In GTA: San Andreas, some missions won’t start when the character is too fat. 7. 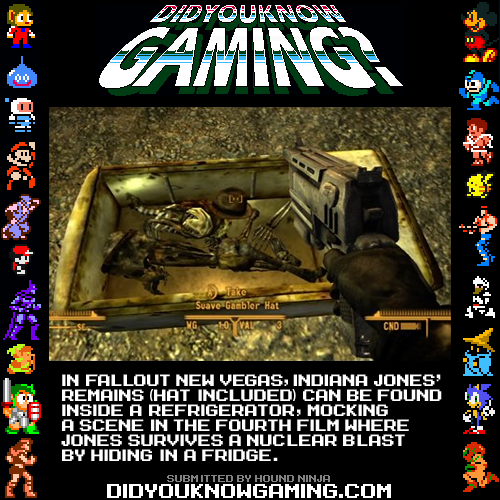 Fallout: New Vegas contains a reference to one of the many factual inaccuracies of Indiana Jones IV.